Is there really something wrong with Watts? Or have we just taught ourselves to think that way? I grew up in Watts, and for as long as I can remember I have been hearing negative stories about the community from family, friends, and the people I knew. At a very early age I learned that the crime rate was high, that the neighborhood was drug-infested, that the schools were hopeless, and that Watts was home to many ills. I heard so much about its dangers that I planned my life around avoiding them. The safest way to live, I figured, was to focus on my education to protect myself—with the expectation that I might one day leave. I spent most of my youth indoors reading and writing, instead of playing outside with the other children. I must admit that, while I never challenged Watts’ reputation as a kid, I was curious about where it came from. Watts had its problems, but it never felt half as bad in the experiencing as in the telling. And I never felt fearful in the way that people expected me to be. As I got older, it bothered me that when people who didn’t live in Watts talked about the community, they always seemed to talk about the 1965 Watts Riots. The fact that this is still true more than 50 years later, in 2016, seems bizarre, given how neighborhoods change and how few of the people who were there are still here. As I studied journalism and learned to write, I decided I had the power to change how people thought about Watts. Three years ago, having entered my mid-20s, I started to publish essays about Watts. I didn’t shrink from Watts’ problems, but I also wrote about my life and family and the joys of it. One essay I wrote for Zócalo Public Square in 2014 became a sensation. In it, I praised Watts for offering a lot of institutions to help young parents and kids, but I wondered why it didn’t offer what I needed as a young, childless college student who was also working. I couldn’t print out an essay or get college-related advice anywhere in Watts. I closed the piece by suggesting that Watts needed a local neighborhood center with computers and guidance counselors that can get help people trying to get ahead. I was especially frustrated because, with every passing day, the distance grew between Watts’ bad reputation and its improving reality. The essay was also published in Time magazine and became so popular that reporters started calling to interview me. Of course, many of them were preparing pieces in advance of the 50th anniversary of the Watts Riots. NBC included me in their special on the anniversary. I used every opportunity to talk about the virtues of the community, the ways it had changed, and the need to improve some of the statistics around poverty that fuel our reputation. I was proud of my work and glad for the attention, but for some reason, it didn’t feel right. I took a hiatus from writing articles to continue my schooling and work while I thought about why I felt unsettled. Was I approaching the story of changing Watts’ reputation wrongly? Had I not done enough? I was especially frustrated because, with every passing day, the distance grew between Watts’ bad reputation and its improving reality. Schools were getting better, crime and violence were even less common, and there were all kinds of fairs and programs in the community that seemed to lead to people getting jobs and health care. I didn’t have to go far to see this. Two impressive developments had launched within walking distance of my home. Last year, a College Track program opened in Watts, helping high school students enter college and also working with them so they can successfully complete their degrees. The second development—this January, chefs Roy Choi and Daniel Patterson opened a much-needed restaurant down the street from me and it quickly became a favorite among people in the neighborhood. Things were looking up for Watts, and for me. I even received a letter in the mail giving me permission to use an old community recreational room to jumpstart my own resource center—exactly like the one I envisioned in my Zócalo article. 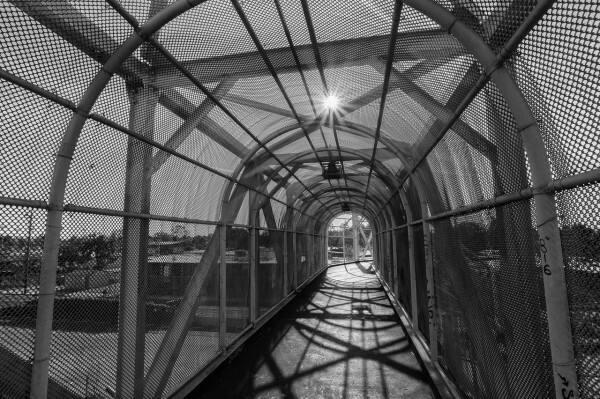 Pedestrian bridge over Blue Line tracks, Watts. But I was less than thrilled—Watts’ reputation still wasn’t moving as fast as Watts. I thought this was funny at first. But then I thought about it some more, and some more after that, and it hit me. He was deeply right. I’m glad for the changes, but they didn’t really mean that much to me, or my own experience of Watts. 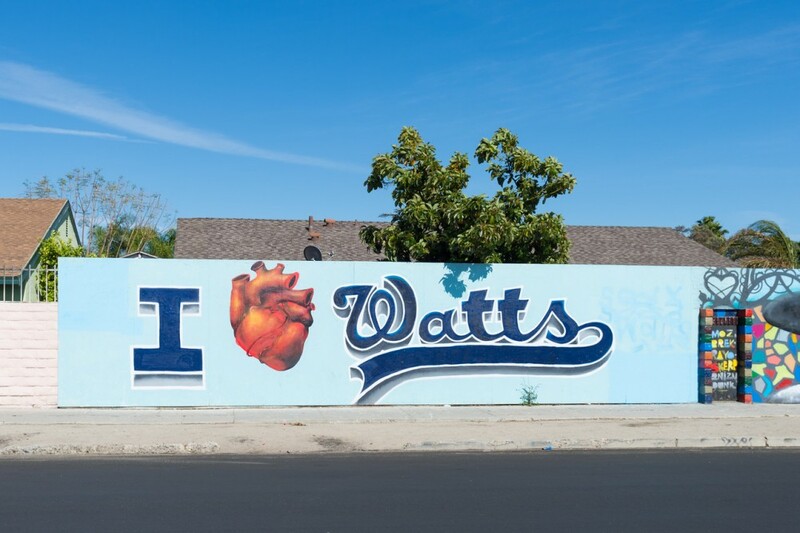 Because Watts was never to me anything like the place people think it was. And if it didn’t really matter to him or matter to me—we had built lives here—why was I worrying so much about its reputation? My problem was mine, not Watts’. Why was I making myself unhappy worrying about a reputational problem that wasn’t in my power to fix? Watts is a fine place, with problems and virtues like other places; I’m proud to live here and I value it for what it’s given me. After all, hadn’t I learned the value of education here in Watts, sometimes from the same people who taught me about Watts’ ills? I have more positive to say about this place than negative (and I’m very grateful to see more and more positive things blooming here). And now that I’ve allowed myself to be happy about Watts, my goals feel even clearer. I won’t stay in my house, and I’m going to go outside and get my resource center up and running. You can think what you want about Watts. I’m too busy enjoying my neighborhood to care. Shanice Joseph, a journalist and student, lives in Watts.